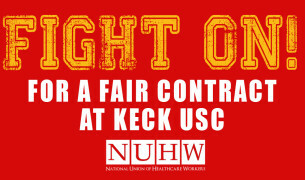 GLENDALE — On Friday, December 11, hundreds of workers at Keck Medical Center of USC, represented by the National Union of Healthcare Workers (NUHW), voted overwhelmingly to reject the University’s “last, best, and final” offer in contract negotiations that have dragged on since the preceding contract expired in April. The vote paves the way for a strike that could come as soon as early January. The vote hinged on several aspects of the University’s offer that were unacceptable to the union members, but some of the most egregious include a wage scale that leaves hundreds of workers well below the market rate for their positions. Some earn as little as $12 an hour for work that has dire consequences for patient safety if it’s not done correctly. Staffing issues, which the University’s offer fails to adequately address, leave overworked and underpaid staff rushing through jobs that require meticulous attention to detail. Keck–USC caregivers hope that their overwhelming rejection of the University’s offer will compel the administration to return to the bargaining table to negotiate in good faith for a contract that both sides can be happy with—one that satisfies the workers’ need for just compensation and respect and dignity for the work that they do, and enables them to attain the University’s goal in making Keck–USC a world-class medical facility for the 21st century. The National Union of Healthcare Workers is a democratic, worker-led union that represents 11,000 healthcare workers in California, including 900 employees of Keck Medical Center of USC.